When it comes to learning how to write, little hands need a lot of practice. 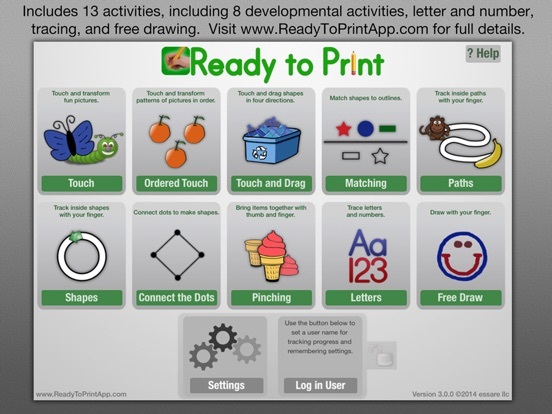 Ready to Print offers kids a series of practice opportunities designed to not only teach kids how to write their letters and numbers, but to also help them learn the motions and shapes they’ll need to get those letters and numbers down on paper. As kids tap images, trace lines, and connect the dots, they’ll pick up the key skills they need to master basic writing tasks. Kids will love the fun pictures and tracing activities, while parents and teachers will love the ability to set up multiple user profiles and track each child’s progress as they build their beginning writing skills. Developers have created a quality app. Parents and teachers have the ability to create multiple user profiles or to allow kids to complete the activities without a profile. They can also turn on voice prompts and a spoken menu to make the app easier for kids to navigate. Each activity in the app has its own help button that explains how to complete the app and gives a bit of the reasoning behind the activity, so it is always clear what kids need to do and why they need to do it. 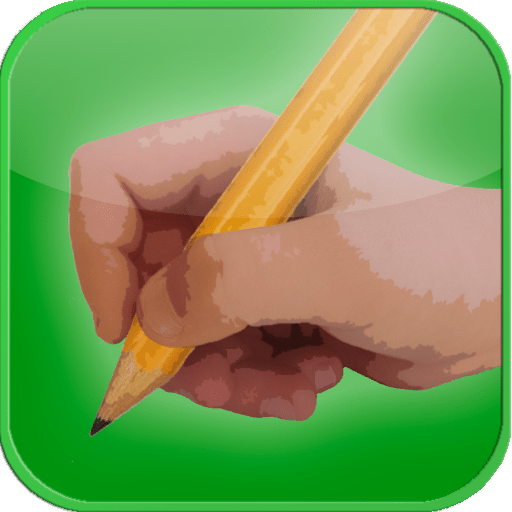 The app is designed to help kids gain the shape and motion awareness they need to learn how to write. Kids start by tapping on different objects to turn them into something else. For example, they change caterpillars into butterflies. 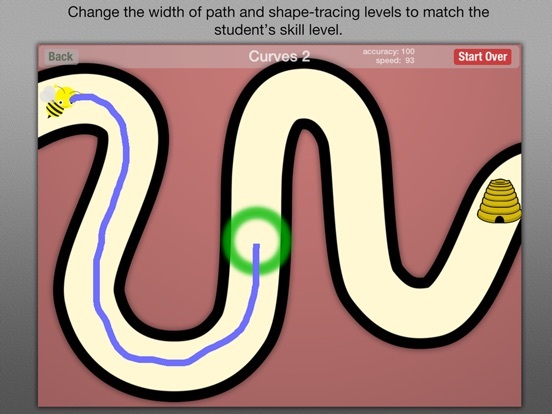 Then the move to other types of activities, such as matching objects, connecting the dots, and tracing different types of lines. 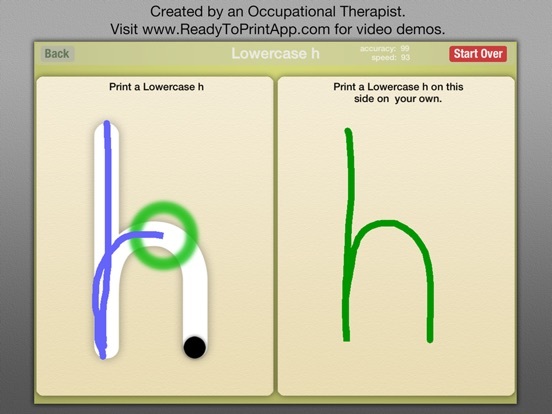 There is also a section that allows kids to trace uppercase and lowercase letters and numbers. 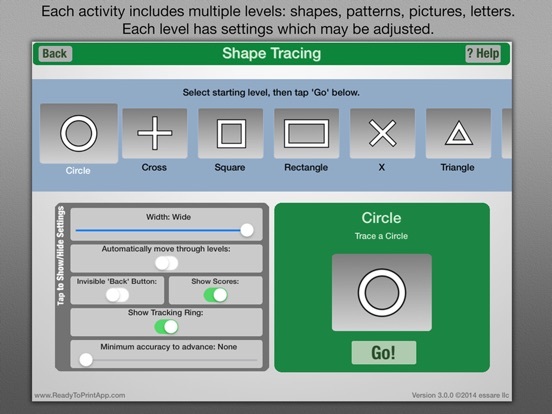 Parents and teachers can track children’s progress and modify the settings for each child. Modifications include adjusting the width of he lines, changing the picture size, and setting a minimum accuracy rating. 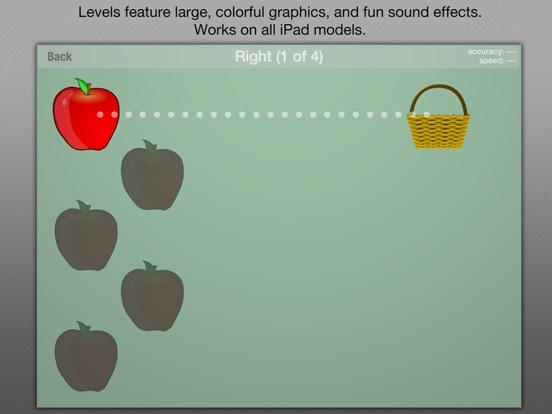 In addition to these settings, parents can access and download a selection of related worksheets so kids can continue to build the same skills outside of the app. While much of the app is focused on tapping, pinching, and tracing, each activity offers a little something different to keep kids interested. The app is all full of fun images and kids are reward with stars and cheers when they successfully complete each activity. Certificates and progress trackers also help to motivate kids as they play. There’s also a fun free draw section for kids to enjoy when they’re finished learning. Given the high price of the app and the number of similar apps available, parents may want to explore their options for purchasing this app. However, the ability to set up multiple user accounts and the fact that multiple styles of tracing activities are contained within the app does help the app to stand out from the competition. Despite the quality of the content contained within the app, developers failed to make the app entirely child friendly. An unprotected parent area gives children access to external links, which lead to downloadable worksheets, and the ability to rate the app in the app store. Considering parents can also control many important settings in the parent area, developers should consider placing this content behind a parental lock.